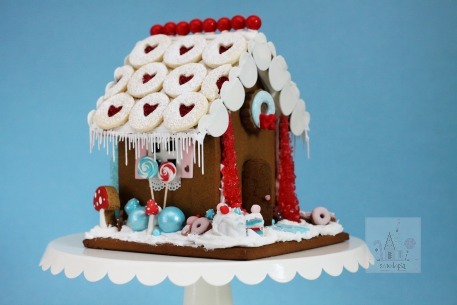 I love the way Irene used cookies as roof tiles and stuck lollipops in the window troughs. 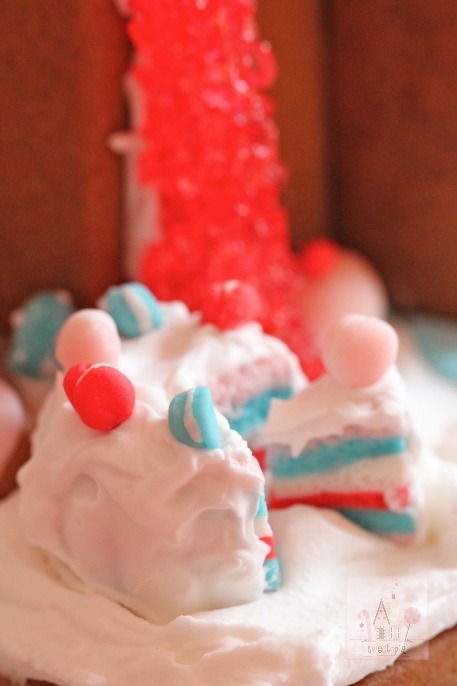 My version is slightly different… smaller heart openings with peek-a-boo red, disco dust and gum paste lollipops on toothpick sticks. 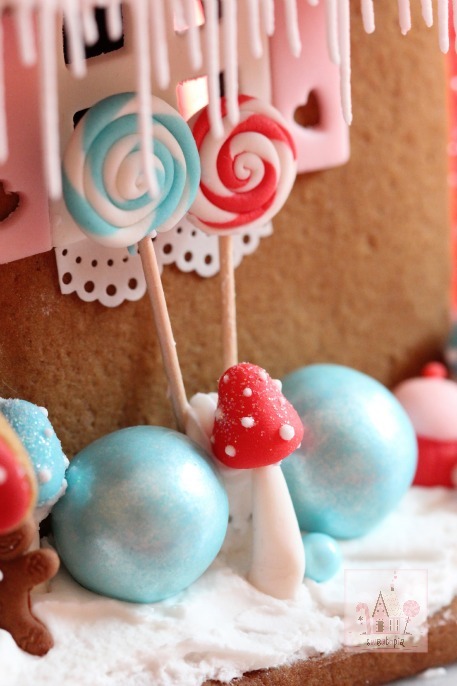 The sweet decorations on each side of the house were essentially mirrorred… large blue gumballs, tiny candy sixlets, and different-sized, hand made mushrooms and cupcakes. 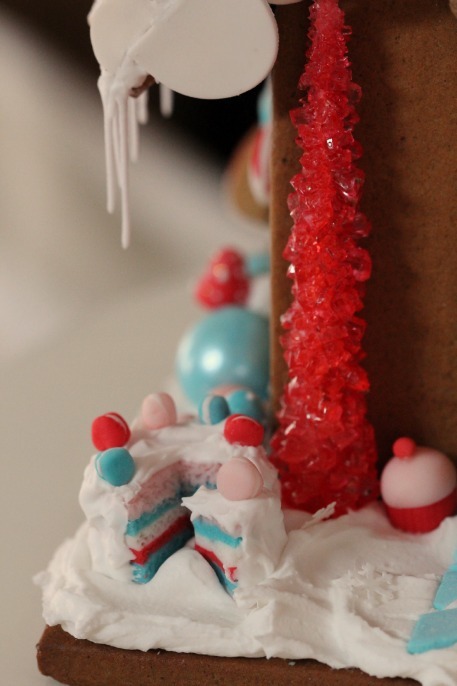 I wanted to create a whimsical, dessert-themed, gingerbread house of sorts. and the odd gingerbread man hiding here and there. The base included a little cut-out circle spot to place a little light (battery operated), for a cosy night. 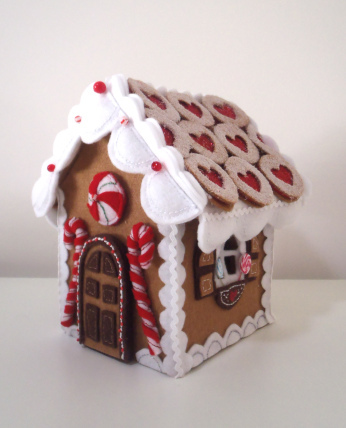 If you’d like to use the template I used for this house, you can find it in this post here. Old Thyme Confections ~ They ship and have an amazing array of candy. Thanks to them for providing some of the candy for my house! Candy.com ~ Another source for an endless variety of candy. Thanks to Sue for this interview on Sweetopia! *You should know that although I have worked with a few of the companies in the examples above, I only recommend what I truly love and stand behind. … and anything else I’ve forgotten to mention, please feel free to ask in the comment section below. 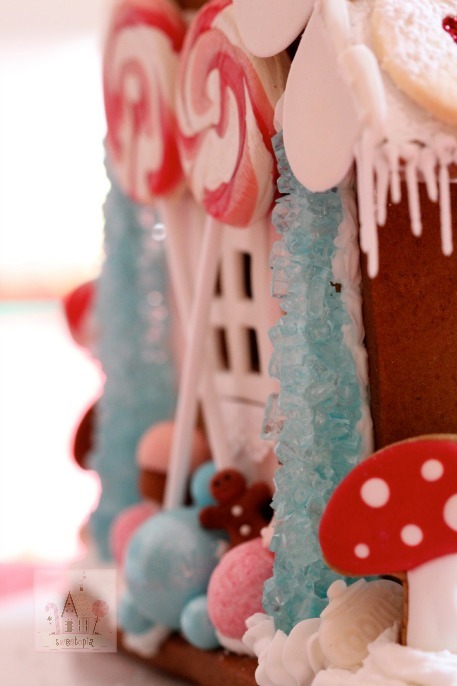 Thanks to Ellie of Ellie Kistemaker Photography for coming over on extremely short notice to help me take some photographs of my gingerbread house! Like the one above which was also used for a group calendar collaboration! Speaking of which, here’s your chance at winning something! Thanks to Marlyn of Montreal Confections, who organized a group calendar project where other cookie decorators and myself were in charge of creating cookies for each month of the year (or a gingerbread house for my month, December). The result is so much fun, I love what everyone came up with! And you have the chance to win a copy of the calendar! So cute! 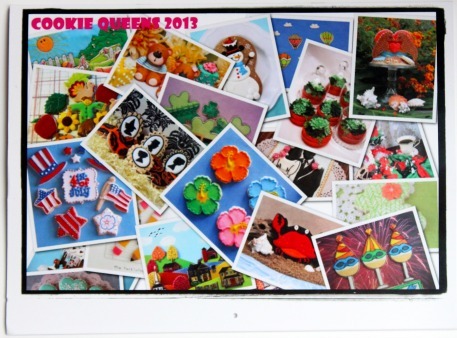 Check out the sites of all the cookiers involved (below), you’re going to find beautiful cookie creations! One copy of the Cookie Calendar, pictured above. It’s easy. There are 5 possible ways of entering. Pick one, pick all – it’s your choice! 1. Let me know in the comment section below, that you’d like to win! 2. Like Sweetopia on Facebook and leave me a separate comment here letting me know you’ve done so (or have already liked on Facebook). 3. Tweet the giveaway, including @sweetopia in your tweet, and leave a separate comment here letting me know you’ve done so. 4. Share the giveaway on Facebook and leave a separate comment here letting me know you’ve done so. 5. Pin a photo from this post, tag @Sweetopia ~ Marian Poirier in your pin, and leave a separate comment here, letting me know you’ve done so. The winners will be chosen randomly at random.org. The contest closes at 7pm EST on Sunday, December 16th, 2012. I will notify the winner via email. CONGRATS to Heather, comment 170 for winning the calendar! Thanks to everyone who entered and Happy Holidays! Already a fan on Facebook and yes I would like to win a calendar. I love to bake! 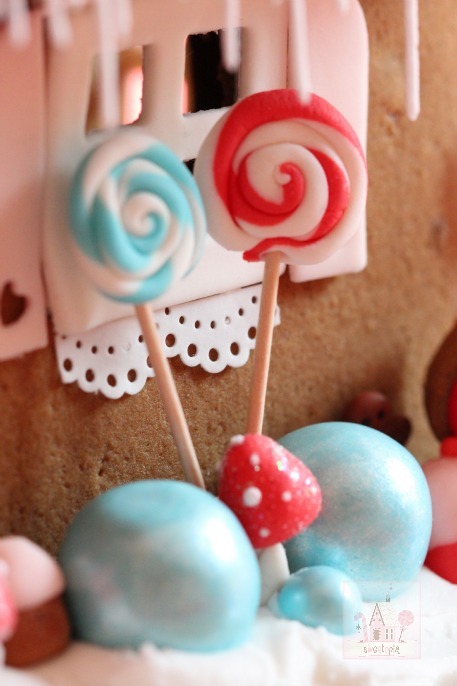 Cookies, brownies, and cakepops using fresh ingredients in all my recipes. I would love to win one of your calenders. They are beautiful. All your creations amaze me! I would love to win the calendar. Lots of likes for your postings on Facebook because everything is top notch beautiful and creative! I have liked your page on facebook already. I have shared your page on face book. Please pick me. HI there! 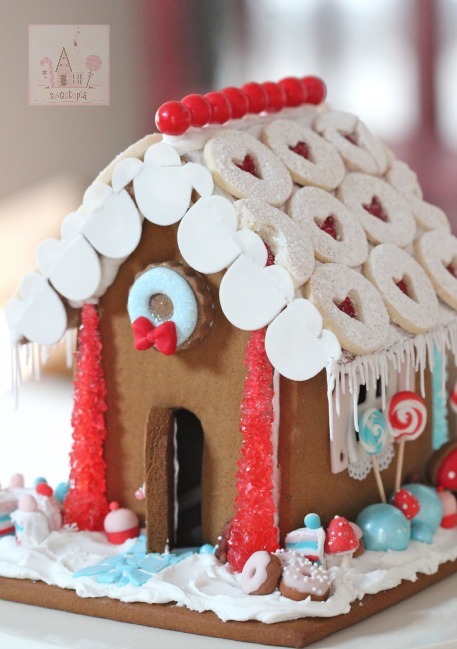 , I have liked sweetopia on facebook and I would love to win the adorable calender! =D cheers! I would love to win one of your calendars! 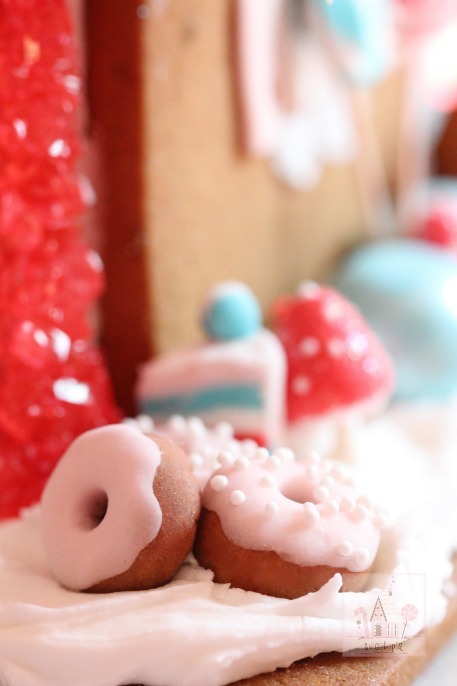 The beautiful photos would be inspirational to my ” baking dates” with my little boys! I have “liked” all of your postings on Facebook because they are just amazing! 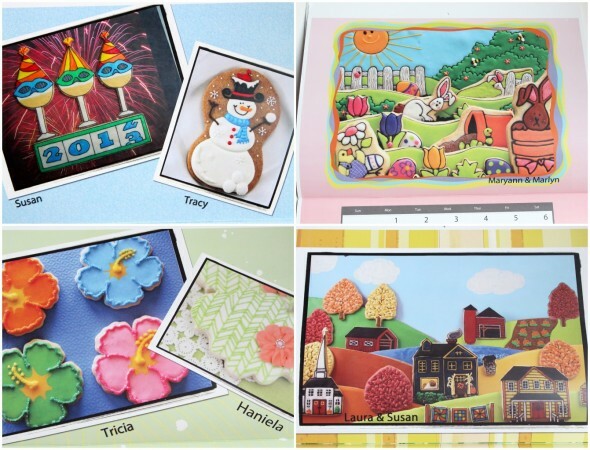 Would love to win a Cookie Calendar. would love a calendar! liked on facebook! I already follow you on facebook and I love everything you do! 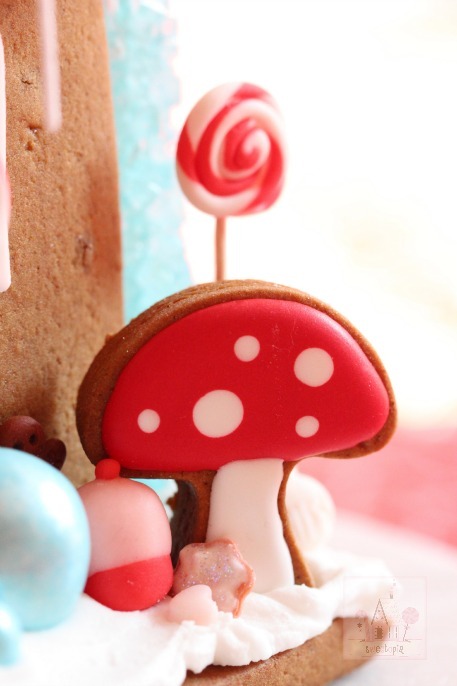 That gingerbread house is really beautiful, I love it! I would love to win a calendar. I have been following you on facebook. I would love to win the cookie calendar! I have liked on FB. This calendar is beautiful! Opps forgot to say I also shared on FB. I would love to win one of these awesome calendars! Your site is awesome! Thanks for all you share! 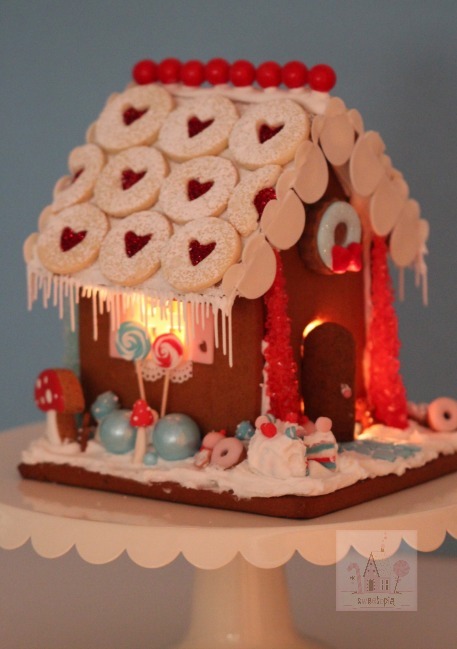 Every time I see your gingerbread houses I get so excited and just want to go to Sugar (a store full of different candies) and build my own!!! HI, @ Ingrid Urena [photographer @ Penguin Designing]: Lol, funny you say that… this one is on display at school in the culinary arts ‘window’ but all 7 houses I made last year I gave away. Perfect little Christmas gifts! Well not a gingerbread house but I did a gingerbread boat. Not nearly as good as yours but here it is. I follow almost every tutorial you publish. This is what I got to with this one. Thanks for sharing all your tips!!! That’s so unique and creative, @ Alicia! Glad to see you had fun making the details. Gorgeous, @ Florencia! Thank you for following me here. Wonderful video tutorials, Marian! Thanks for sharing!